#1. 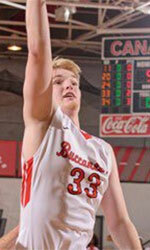 Matthew Dogan (6'7''-F-94, graduated '17, plays pro in Germany) led RSV Eintracht Stahnsdorf to a 1-point victory over the third-ranked WSG Koenigs (6-4) 61-60 in the German Regionalliga (fourth division) last Friday. He was MVP of the game. Dogan had a double-double by scoring 19 points and getting 16 rebounds in 38 minutes; quite an impressive performance considering it's only his second season in pro basketball. It was the game of the round between two top 3 ranked teams in group North. RSV Eintracht Stahnsdorf (12-4) is placed second. It was his team's first victory after three consecutive loses. Dogan has individually a very good year with high stats. He averages 17.3ppg, 5.6rpg and 1.1apg in 16 games he played so far. #2. Raphell Thomas-Edwards (6'6''-G/F-93, graduated '15, plays in United Kingdom) could not help Leicester Warriors (5-10) in their last game on Saturday. Despite his very good performance Leicester Warriors was defeated 92-79 on the road by the higher-ranked Derby Trailblazers (#7). 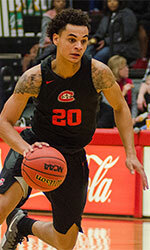 Thomas-Edwards recorded a double-double by scoring 26 points and getting 15 rebounds. He also added 2 blocks. This season Thomas-Edwards has very high stats. He averages 23.0ppg, 14.7rpg, 3.8apg and 1.5spg. #3. C.J. Oldham (6'8''-F-91, graduated '14, currently in Germany), who plays in the German ProB (third division) was not able to help Elchingen (9-8) in their last game. Despite Oldham's good performance the fifth-placed Elchingen (9-8) lost 75-81 in Frankfurt to the higher-ranked (#3) Fraport Skyliners II in the South group. He scored 10 points and had 3 steals in 20 minutes. 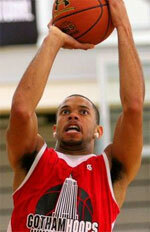 This year Oldham averages 6.8ppg and 2.8rpg in 16 games. #4. Adam Blazek (6'1''-PG-92, graduated '15, plays pro in Canada) was not able to secure a victory for the Sudbury Five (9-12) in their game against the Windsor Express (11-8) in the NBL Canada. Blazek recorded 5 points. The Sudbury Five (#5) was defeated 115-107 in Windsor by the second-ranked Express. It was Sudbury Five's fourth consecutive loss in a row. It's Blazek's first season with the team. This year he averages 6.8ppg and 2.8rpg. #5. Jabs Newby (6'2''-G-91, graduated '14, plays in Spain) led Algeciras to an easy victory against the fourth-ranked Cordobasket (8-6) 90-72 in the Spanish EBA (fourth division) on Saturday night. Newby had a double-double by scoring 12 points and getting 13 rebounds. He also added 3 assists in 34 minutes. C.D. UDEA Baloncesto Algeciras (14-0) is placed first in Group D-B. So far his team won all fourteen games in the Regular Season. There are only four games left until the end of the Regular Season. So now every game will be critical. Newby has relatively good stats this year 11.5ppg, 9.5rpg and 2.0apg in two games.